Over the last number of decades the growth in China has been explosive. From manufacturing to population, China has presented itself as the world’s largest consumer as well as supplier. One of the major concerns of ecologists and the Chinese government itself, is the almost uncontrolled need and use of energy, including coal. In an effort to cap the high levels of pollution, China has significantly reduced its demand for coal, which is a leading contributor to their pollution problem. 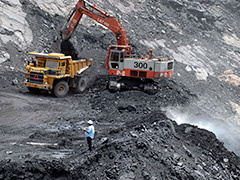 The export of coal from the United States to China has been big business. The huge demand for energy in China that continues to expand, has been quite a profitable venture for many of the American coal producing companies. But this is rapidly changing, as China experiences the devastating effects of pollution caused by coal and other fossil fuel based products. The 12th five year plan that the Chinese government has established is founded on a combination of public outcry and a sluggish economy. The plan is to put an industry cap on coal production domestically as well as imports and reduce the use to 3.9 billion tons by the year 2015. Their plan might not have been well thought out, as coal is already beginning to show up in piles and are unused at many of their power plants. Concern over air quality standards and the continued increased demand for energy has brought China’s coal use to almost a screeching halt. The main focus of the Chinese government is now on their plans for the increase of non-fossil fuel energy. The plans include increasing potential renewable and sustainable energy sources to 30% of electricity installed by 2015. China is turning their attention from fossil fuels and is quickly becoming one of the world’s largest producers and users of such renewable energy sources as solar. What Happens Inside a Power Plant? Are Green Certified Homes Worth More? Posted on June 3rd under Global Ecology, Non Renewable Energy Sources. Is there even a possibility that the U.S. could learn from what China is doing? They recognize that they need to make drastic changes, especially because of all of the pollution they have created. The U.S. is so bogged down with political influence and oil company dollars that they can’t see the forest for the trees. This is a survival topic and we are falling behind in the direction we need to be going in. Just when American businesses thought they could get some profit from China, they go and make a reverse to higher quantities of alternative energy. Serves the coal companies right. Everyone should be looking at wind, solar and hydropower and stop using the polluting oil and coal. China might not have been very progressive to begin with, but they sound like they are moving past the U.S. at record speed. The almighty profit is what seems to make the world go around. It should be investing in every kind of energy and products that will bring a positive to people, the earth and all of the living creatures that will benefit from it. China has made a smart move in reducing their coal consumption.